In November 2013, Chief of Staff of the Army, General Ray Odierno visited Fort Belvoir, Va for a briefing on the latest from PEO Soldier, the premier implementer of the latest in small arms, equipment, and clothing worn or used by the individual Soldier in the United States. There the general received some hands-on experience with next-generation fused thermal and night vision goggles, more accurate laser targeting systems, improved body armor and innovative devices to provide Soldiers electrical power in the field. An Officer from the Program Executive Office (PEO) Soldier team briefs U.S. Army Chief of Staff Gen. Ray Odierno on the Female Improved Outer Vest during his visit to their facility at Fort Belvoir, VA, Nov 1, 2013. Photo ©: Staff Sgt. Steve Cortez, U.S. Army. Odierno received first-hand briefings from PEO Soldier’s four project managers: PM Soldier Sensors and Lasers, PM Soldier Warrior, PM Soldier Weapons, and PM Soldier Protection and Individual Equipment. According to an Army Press Release, the general was particularly interested in PEO Soldier’s efforts to achieve one of the Army’s main development goals, which is lightening the load on Soldiers. With the development and increased use of body armor, night vision equipment and other power hungry electronic gear, today’s Soldiers carry more weight than ever before. 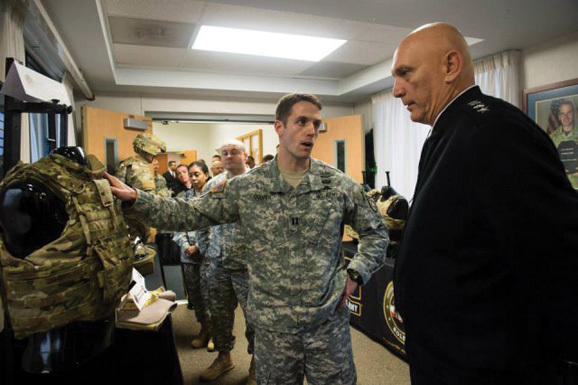 General Odierno learned that the Maneuver Center of Excellence and U.S. Army Natick Soldier Research, Development and Engineering Center, are working together to find “evolutionary and revolutionary” approaches to lightening the Soldier load. He was briefed specifically on two programs which emerged from that effort. One of those briefings dealt with power requirements and included discussions of the conformal battery, which shapes to the Soldier and provides power to numerous devices; and a solar blanket, which converts solar energy to power. The latter is important because PEO Soldier is working to make Soldiers more energy self-sufficient. The other briefing had to do with reducing the weight of the soldier’s typical rucksack. Here, the general learned that PEO Soldier is collaborating with the Marine Corps on redistributing weight from shoulders to the hips. This is similar to hiking backpacks that use a waist belt to lighten the load on shoulder straps. PM Soldier Warrior provided the general with an update to the Nett Warrior program, which the PM said is now shifting its focus to leveraging existing technology, to get voice and data integrated IT solutions to ground troops much quicker. He explained how the system is replacing the original comm-vest with a commercially-available Android smartphone to provide situational awareness capabilities to dismounted Soldiers. The PM said developing apps would increase the capability of the Nett Warrior system. The General also visited labs that demonstrated how PM Soldier is using 3D printing in its machines shops, and is working on designing body armor and soldier protective gear that is gender specific, as females are taking on more active combat roles, and have areas of anatomy requiring protection that differ from that of male soldiers. Capt. 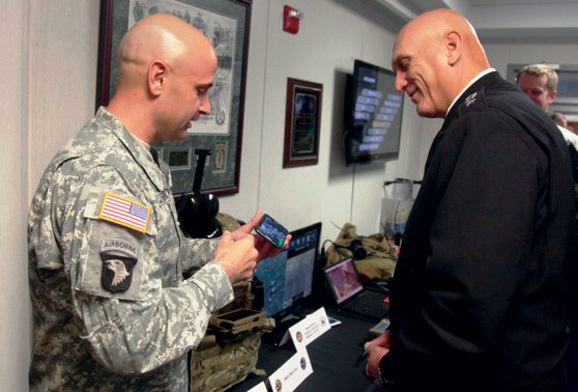 Paul E. Cluverius briefs Nett Warrior to Gen. Ray Odierno, chief of staff of the Army. Odierno visited Program Executive Office Soldier on Fort Belvoir, Va., Nov. 1, 2013. Photo: Courtesy US Army.